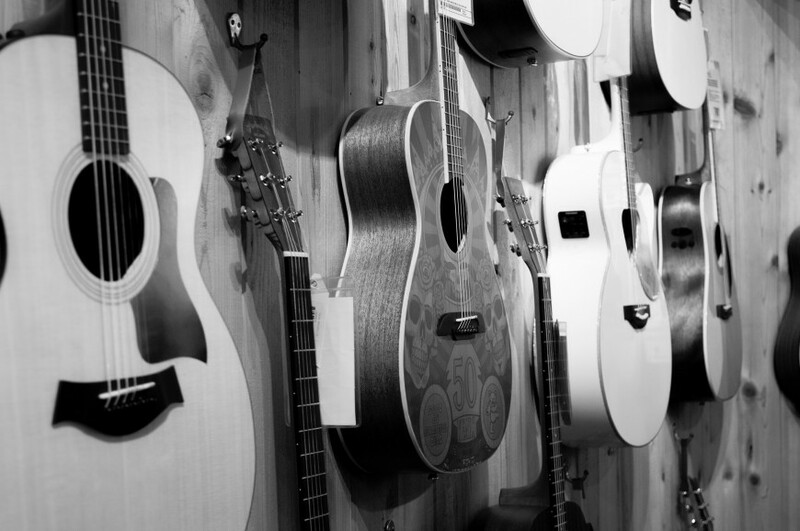 Buying your first guitar can be daunting. You need a decent instrument, but you don’t know how to recognize one. You’re excited to start playing, but you don’t want to spend a fortune before you know you’ll stick with it. Here are the important points to consider in choosing your first guitar and making it last for years. Steel Strings or Nylon Strings? Answer this question first. While both kinds of guitars have the same notes and tunings, the differences in construction, sound, and feel are critical to their suitability for certain styles. To play flamenco or classical music, you need a nylon string guitar. Steel strings are more appropriate for genres like rock, pop, and blues. Genres like folk, fingerstyle, and songwriting are more flexible. If you’re interested in one of the latter three genres, have someone play the same music on both kinds of guitars and decide which sound you prefer. A vocabulary note: steel string guitars are often called simply ‘acoustic guitars’ in contrast to ‘classical’ or ‘nylon string’ guitars. Technically, though, acoustic just means that a guitar projects its own sound and it doesn’t need to be amplified. Therefore, nylon string guitars are also acoustic guitars. Use the terms ‘acoustic steel string guitar’ and ‘nylon string guitar’ if you want to be especially clear. Can I Use This Old Guitar? Guitars that have been sitting around in closets for years (or worse, attics or basements for decades) are infamous in the guitar repair world. Acoustic guitars are made of thin wood, which shrinks and expands in response to changes in temperature and humidity. After years of being stored with no attention, the neck and body are often warped beyond repair. Even when restoration is possible, it's often not worth the time and effort. If you acquire a guitar that has been stored with care, it may still be usable, but it will certainly need new strings. It may also need some adjustments to be easily playable. Take it to a guitar shop for a professional assessment, tune-up, and string change. Should I Buy A Used or New Guitar? Hand-crafted or Factory-made? New, factory-made starter guitars are the safest choices for beginners. While there are maybe treasures and bargains to be discovered in the world of used guitars, as a newcomer you won’t know how to recognize them. Similarly, hand-crafted guitars vary considerably in their quality and tend to be priced outside a beginner budget. I recommend a budget of $200-$400. You may be able to find a suitable instrument for slightly less if necessary, but don’t ever spend less than $100. Cheap guitars are hard to tune, uncomfortable to play, and difficult to learn even the basics on. If you have more to spend, that’s great! However, consider saving that money until you understand the instrument better. Choosing a high-end guitar is a personal matter that involves distinguishing subtleties in sound and feel. There is no one right decision that an expert could make for you. Once you’ve been playing year or two, you’ll develop your own preferences and be able to make a wiser decision. Keep in mind that most serious guitarists have more than one guitar. Even if you get a nicer instrument in a few years, a decent starter guitar can serve you for the rest of your life as your travel or backup guitar. I still use my first classical guitar (a Yamaha CG-151S that cost me $300 in 2005) for teaching, lending to visiting students, and in any situation that seems risky for my concert instrument. Should I Get A Full-Size Guitar? If you’re buying a guitar for a child, the guitar must fit the student. Children usually do best with half and three-quarter size guitars. If you’re a petite adult or have small hands, you may be tempted by a small guitar. However, smaller guitars generally have quieter, less quality sound, so it is a sacrifice. If you decide it’s really necessary, I recommend a seven-eighths-size guitar or guitar with a shorter fretboard. What Guitar Brands Are The Best? There is no over-arching answer to this, and availability will vary depending on where you live. Some brands of beginner nylon string guitars that I’ve had good experience with are Yamaha, Cordoba, and Alhambra. Steel-string guitar brands that have served my beginning students well are Taylor, Fender, and Yamaha. These lists are not exhaustive, and I only mention what I can vouch for based on personal experience. Guitar case. A soft gig-bag is okay if you plan to play mostly at home. A sturdier case is better if you plan on traveling with your guitar. Electronic Tuner. The kinds that clip onto the headstock work best. Guitar stand. It’s nice to be able to set your guitar down in a safe and convenient stand rather than on the sofa or bed. Keeping your guitar out can encourage you to practice more, too. Music stand. If you’ll be playing from any kind of sheet music, you’ll want one. Footstool. For classical and flamenco players, elevating the left or right leg will help you find a stable and comfortable playing position. Capo. You’ll want a capo if you plan on singing while you play or accompanying vocal recordings. Flamenco guitarists also use capos, although they are not necessary if you’ll only be playing solo. Picks. Picks are common in steel string guitar genres and seldom used with nylon string guitars. Store your guitar at room temperature (around 72ºF/23ºC) and fifty-percent humidity. Avoid sudden temperature changes, heating and cooling vents, and contact with direct sunlight. If your home is particularly dry or humid, store your guitar in its case with a humidity control rather than on a guitar stand. Air travel is more complicated. Ask beforehand what your airline’s policy is for guitars, and never check your guitar as luggage. Loosen the strings before you fly to avoid excessive tension caused by environmental changes. If at all possible, take your guitar into the cabin as your carry-on. On large planes for overseas flights, the guitar usually fits into the overhead compartment. On smaller planes, you may need to gate-check your guitar. This is not ideal, but at least it only leaves your hands at the door to the airplane. Obviously, you’ll need to replace a string if it breaks. If the strings are fairly new and you break only a single string (due to overtightening, for example), you can replace only that string. You should also plan on replacing the strings a few times a year due to normal wear and tear. Old guitar strings sound dull, don’t stay in tune, and may even feel unpleasant to play. If you notice visible wear like corrosion or fraying at the frets, it’s definitely time for a change. For optimal sound, you’ll want to change your strings before you can see the wear and tear. That interval is usually between one and six months. I play my guitar several hours per day and would ideally change the strings monthly (though I often let it slide for longer). Typical beginning players would benefit from a string change every three to six months. The following information adapted from a previous article -- Guitar 101 for Parents of Young Beginners -- will help you get started playing. Learn the important parts of the guitar. All guitars need to be tuned often – it's perfectly normal! The wood of the guitar responds to changes in temperature and humidity, and the strings loosen and stretch and sound lower (flat) or higher (sharp) than they should. Plan on tuning the guitar before each lesson and practice session. Each string has a pitch (or note) that it needs to match. Each tuning peg corresponds to a particular string. Follow the string to its origin on the headstock to know which peg to turn. Turning the peg counterclockwise tightens the string and makes it sound higher. Turning the peg clockwise loosens the string and makes it sound lower. If a string is extremely out of tune, it may register as a different note to the tuner. For example, if the first string is way too low, it may read 'D' instead of 'E'. That means you need to turn the peg quite a bit until the note says 'E', and then tighten the string more slowly until the needle arrives in the center. Brand new guitars and recently restrung guitars often get extremely out of tune. The musical alphabet (below) goes from A to G and then starts over. Use it to help you know which way to turn the strings if the tuner registers the wrong note. The pairs of notes with the sharp symbol (#) and flat symbol (b) are effectively the same (for tuning purposes), and fall in between two ‘natural’ notes. >>> Learn more with Leah! Leah Kruszewski teaches online to classical, flamenco, and beginning guitar students.